In a surprise announcement following a string of daily releases this week, Apple today announced a major update to AirPods, the company's wireless earbuds. As widely speculated over the past several months, the new generation AirPods come with support for hands-free 'Hey Siri' activation, feature improved performance over the original AirPods (which launched in late 2016), and support wireless charging (using the Qi standard) via an optional case. While the second-generation AirPods share the same design of the originals, their wireless architecture has been completely rebuilt with the inclusion of Apple's new H1 chip, which is debuting today. Apple has not provided in-depth technical details about the underpinnings of the new H1 chip, focusing instead on the practical benefits of AirPods' new "custom audio architecture". First off, the H1 chip allows AirPods to deliver "up to 50 percent more talk time compared to first generation AirPods". Additionally, switching between devices while listening to music on an iPhone, iPad, or Apple Watch is now up to two times faster, while connection time for phone calls is 1.5x faster compared to the original AirPods. Apple also notes that the second-generation AirPods feature a 30% decrease in latency when playing iOS games – a test the company performed with Tomb of the Mask and Doodle Jump, according to the AirPods' product page. The webpage also confirms that iOS 12.2, watchOS 5.2, and macOS 10.14.4, which haven't been released to the public yet, will be required to set up the new AirPods. 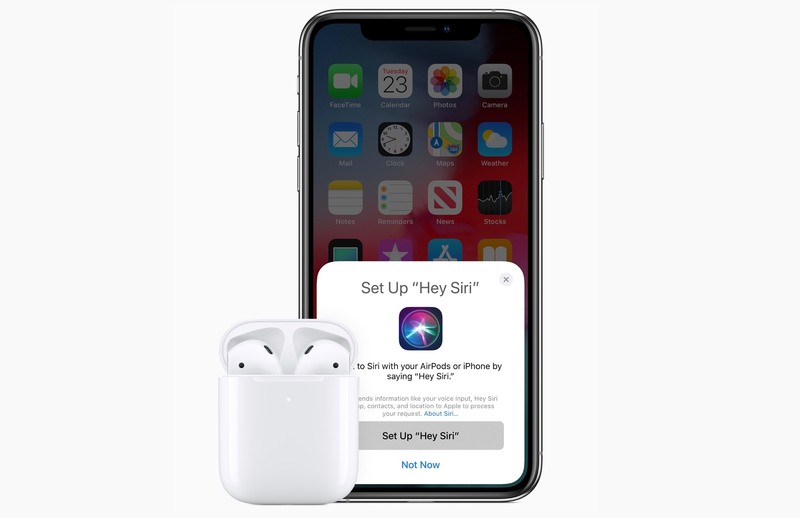 Thanks to the improved wireless performance granted by the H1 chip, the second-generation AirPods support hands-free activation for Siri using the standard 'Hey Siri' command. Previously, AirPods could only activate Siri with tap gestures, or they could mirror the sound of 'Hey Siri' activation from a nearby paired iOS device, but they could not summon Siri directly with the 'Hey Siri' command. It'll be interesting to see how Siri's performance and sound quality on the new AirPods will compare to the same feature on the iPhone XS and 2018 iPad Pro. The second-generation AirPods with a wireless charging case are available at $199. For those not interested in wireless charging, it is also possible to buy the second-generation AirPods with a standard case for $159. And if you want to retrofit your first-generation AirPods with a new wireless charging case, it is also possible to buy one separately for $79. According to Apple, the case is compatibile with all generation of AirPods but, of course, it will not add any of the audio improvements of the second-generation model to the original AirPods from 2016. Notably absent from today's announcement is AirPower, the wireless charging mat compatible with iPhone, AirPods, and Apple Watch that the company originally announced at their September 2017 media event with a release date of 2018. The new AirPods product page makes no mention of AirPower whatsoever – in fact, the only reference to AirPower that was left on Apple.com was on the old AirPods webpage, and it has been removed following today's refresh. In its press release today, Apple simply refers to "Qi-compatible charging solutions" with no mention of the existence of AirPower. We'll be testing the second-generation AirPods here at MacStories next week. In the meantime, you can find more details on Apple's product page and view all your buying options for the second-generation models and cases here.